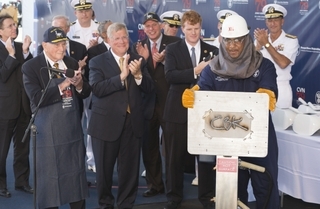 NEWPORT NEWS, Va., Aug. 22, 2015 (GLOBE NEWSWIRE) -- Newport News Shipbuilding, a division of Huntington Ingalls Industries (NYSE:HII), today celebrated the keel laying of the aircraft carrier John F. Kennedy (CVN 79), the second ship of the Gerald R. Ford class. Caroline Kennedy, the daughter of the ship's namesake, the 35th President of the United States, is the ship's sponsor. She declared the keel "truly and fairly laid" via video to signify the ceremonial start of construction. "The aircraft carrier came of age in a time of conflict," Caroline said. "It was untested, and the capabilities it brought were questioned. 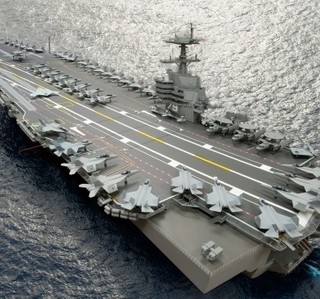 Since those early days, the carrier has come to be recognized as a symbol of peace, strength and freedom." Caroline's video was introduced by her cousin, Rep. Joseph Kennedy, D-Mass. Other ceremony participants included Virginia Gov. Terry McAuliffe; Rep. Randy Forbes, R-Va.; Rep. Bobby Scott, D-Va.; Vice Adm. William Hilarides; Assistant Secretary of the Navy Sean Stackley; Rear Adm. Earl Yates, the first commanding officer of CV 67, the first aircraft carrier to bear the name John F. Kennedy; and Newport News Shipbuilding President Matt Mulherin. During the ceremony, Caroline's initials were welded onto a steel plate by Leon Walston, a Newport News welder from Massachusetts. The plate will be permanently affixed to the ship, signifying the sponsor's enduring relationship with the shipbuilders and crew. 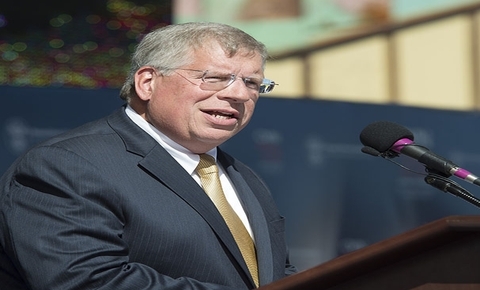 In his remarks, Stackley expressed the significance of aircraft carriers, calling upon shipbuilders to recognize the importance of what they build. "They are our nation's great instruments of security and … of goodwill," he said. "In times of crisis, they are the first to respond, and when called upon, they will deliver the final word in the bidding of our nation. So let this great purpose serve as a constant reminder—as inspiration to you, the men and women of Newport News Shipbuilding—that shipbuilding is not just what you do; it is who you are. And that building great ships—it is not just your tradition; it is your duty." Gov. McAuliffe emphasized the importance of John F. Kennedy's future presence in the Navy fleet. "President John F. Kennedy was an inspiration to all of us," he said, "so it is only fitting today that we now have a U.S. President who now will have two aircraft carriers named after him." 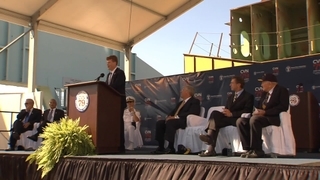 Rep. Joseph Kennedy spoke of the original USS John F. Kennedy and its legacy that will continue with the new aircraft carrier. "USS John F. Kennedy demonstrated strength to our enemies and support for our allies," he said. "Today, as we lay the keel of CVN 79, the next USS John F. Kennedy, we begin construction on a ship with the same mission and the same spirit, but with new capabilities and a new generation." Mulherin spoke of the shipbuilders constructing John F. Kennedy, highlighting their commitment to ethics once emphasized by President Kennedy. "While this aircraft carrier that we lay the keel for today will serve as a tangible legacy of our nation's 35th President, so too will the people behind the steel," he said. "When we say the greatest shipbuilders in the world work right here, it isn't just because we build the most sophisticated ships known to man. It's also because of the way in which we build them. Our shipbuilders demonstrate ethics, integrity and courage every day." John F. Kennedy will be the second U.S. Navy ship to bear the name of the 35th President. Crew members who served on the first John F. Kennedy attended and were recognized during the ceremony. To conclude the event, Yates, the first commanding officer of CV 67, signaled crane operators to lift the aircraft carrier's engine room No. 2 unit into the dry dock while more than 1,500 guests watched. 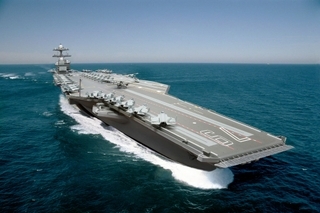 A video of the ceremony, along with additional information on John F. Kennedy (CVN 79), Caroline Kennedy and the Ford class of aircraft carriers, can be found at http://thefordclass.com/.